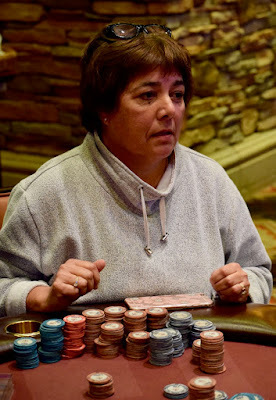 There's an all in UTG, Kim Russell moves all in, there's an all in for just 3,600, a call of the 3,600, another all -in and BigStackSharonSanchez decides it is Gambol Gambol time, so she moves in for her Sierra Nevada Mountain Range of chips. That's 5 all-in's and the 6th player decides to hold on to his remaining stack. Pocket Tens for , the 3,600 stack. Sharon claims hand-dominance on the 7-7-5 flop and maintains it thorugh the 4 turn. The river Ten gives a quintuple-up - but no bounties - while Sharon's full house earns her $600 more in bounties and reduces the field to four players. Well, before I can post this, Sharon claims yet ANOTHER $200 bounty and there's 3 left. Sharon has what looks to be close to 90 percent of all the chips in play. For those keeping score at home, that's $1,000 in bounties for Sharon in three hands, going back to the previous blog post.